It has been half a month since returning from my time abroad interning at the Peggy Guggenheim Collection. I am now back to the Appalachian foothills of rural, northwestern Alabama. A daily glass of Campari Spritz has been replaced with a red-solo cup of my mom’s sweet tea. The atmosphere around me has been one of my biggest adjustments. In Venice you can feel the history in the air itself while you’re ambling down silent alleyways that have seen generations of life and death. There is a level of visual pureness engrained in the city that I have often found in art. One of the first questions I get about being a Guggenheim intern is, “What was your favorite piece in the collection?” For me, it’s a fairly easy, but unexpected (to some) answer: Morris Louis, #48, 1962. Morris Louis is an artist whose work I easily recognize. Especially after living in Washington, DC and spending almost every weekend amidst the halls of the National Gallery East Building. Prior to arriving in Italy, though, I had done little to no research on him. I knew he was part of the Washington Color School with Kenneth Noland and was a minimalist, but that was about it. One of the main reasons I found myself so drawn to Louis’s work while living in Venice was the pure quality that resides within it. I find this idea of naturalistic purity in #48 reflective of the Venetian ambience. It is important to note that in no way does Morris Louis’s work create a narrative or re-creation of a place. Minimalism, the artistic movement in which Morris’s work is often categorized, is strictly characterized by its simplistic form and non objectivity. Frank Stella, also known as a minimalist, perfectly summed up the movement when saying, “What you see is what you get.” Color, technique, and composition become the only things one might take into consideration––interpretation is limited. Venice, to a certain degree, feels untouched by modern humans, especially because of the lack of automobiles and the incredible historic architecture. #48 evokes a similar feeling of pureness. When looking at it, I feel like I’m engaging with something liberated from the modernities of contemporary industrial society. At first glance, #48 might read as a painting created in a factory warehouse, but it represents the opposite. Viewing it on a screen simply doesn’t do the painting justice, so if you get the chance, viewing it in person will give you the best understanding of it. When viewing in person, you’ll notice there is absolutely no separation of canvas and pigment. Because Louis left the canvas unprimed, the canvas itself becomes important in the way we experience his painting. The unprimed canvas allows the thinned paint to soak into the cotton structure of the canvas, joining the two elements of paint and canvas and nearly eliminating any signs of the artist’s marks and brush strokes. Take just a moment to think about the history of painting before 1962. One of the specific characteristics of post-World War II Abstract Expressionism is all about the artists’ hand. Artists’ gestures are evident across the entirety of the canvas; it is an accumulation of pigment. For the vast majority of painting I would argue that the paints’ textural quality, even in minuscule amounts, is present. In #48, the accumulation of pigment has been reduced to a completely flat plane, breaking the barrier between canvas and paint and subverting any typical textural quality of paint. The gesture of the artist in #48 becomes so hidden that it reads as ethereal. You really begin to ask yourself, “How did these marks get there?” In fact, when Louis created it he did not even let his hand touch the canvas, but used “daubers” to apply the paint at the top. He then lifted the canvas to let the paint drain down vertically. The only entities that create the painting become gravity and the canvas itself. Using gravity as an artistic tool reflects that idea of naturalistic purity. It becomes more than an application of pigments. #48 begins to blur line of painting and sculpture. Now by no means am I saying that this piece is a sculpture, but the way we experience it is reminiscent of the way we encounter sculpture for two reasons. One, the canvas itself has become a tool for creation and has a duty beyond a surface to hold paint. Two, the paint surface has been so flattened and reduced that it visually challenges what a painting can be. Louis has given importance and attention to not just the paint, but to the canvas itself. 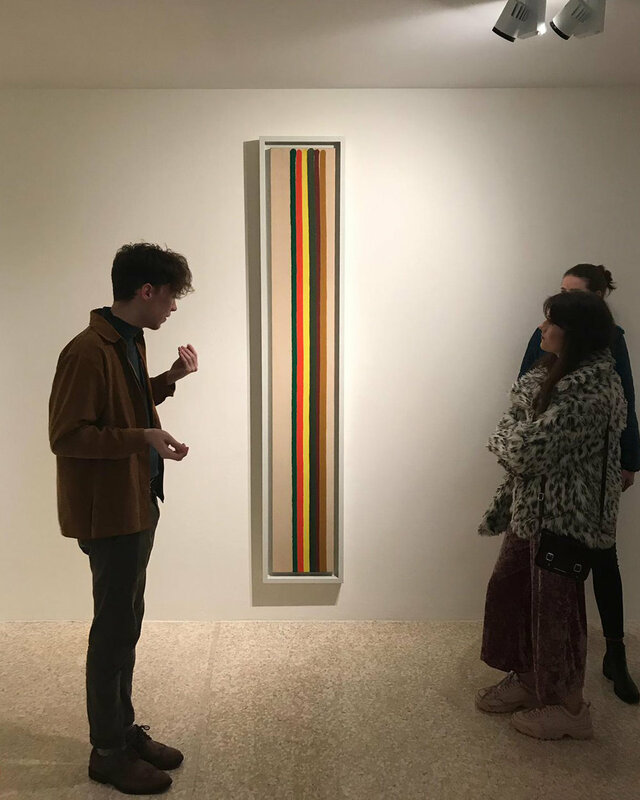 From 1961-1962 Louis created the Stripes series, comprised of around 230 Stripe paintings. In 1961, Louis would use canvases at around the same size as #48; 80 x 12 inches. He then realized he could dramatically cut in half his spending costs and working time by using wider canvases. In 1962, he began creating several of these stripe compositions on large horizontal canvases. Then, he would crop out the finished vertical paintings from the large horizontal canvases. In the modern age of Instagram and Photoshop the idea of cropping an image is very normal, but in early 1960’s painting I find it to be incredibly contemporary and resourceful. By saving time and money it really opened the door for him focus on color. I can spend hours pondering over color in a Morris Louis work. Actually, I did on a pretty frequent basis––when guarding rooms at the museum. This series is all about taking in the pure nature of color and its ability to transport you; not to a deep narrative meaning, but to the sensory experience that color can create. 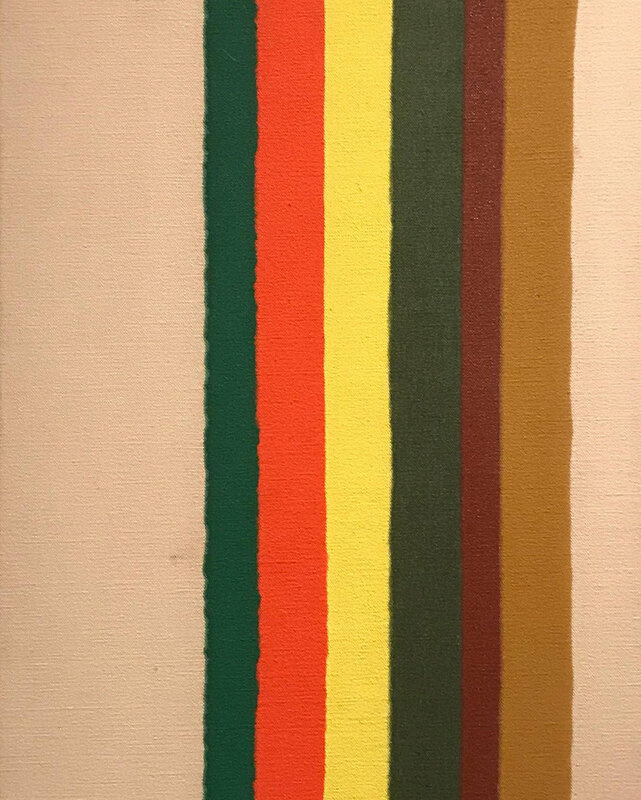 Critic Irving Sandler reviewed, “Like Albers, Morris Louis is concerned with the particular kind of visual excitement that color can create, but unlike Albers whose pictures are ascetic and didactic, Louis’ are sensuous and hedonistic”¹ There is a visual language to #48. The language created by its use of color reads like a page from a book; from left to right. First, my eye goes directly to the left column of intentional negative space. Next, there is a highly saturated emerald green stripe, and then a bright red; complementing colors. The third stripe is a luminous yellow. I find it no coincidence that the first three colors Louis lays out are the brightest. They immediately stimulate the eye and set up a viewing language. After the yellow there is another green. It's more of a forest shade and not as bright as the first stripe, but it's familiar; it is comfortable to the eye. Then, there is an ambiguous hue that could be interpreted as red, purple, or brown; based on the color you take it into context with. When looking at it with the green stripes, it appears more red; when you focus on it with the yellow, it appears purplish. The last stripe is neutral; a shade of brown, evocative of the canvas hue. This neutrality allows your eye to rest and tells you where to stop. A pure, visual harmony has been reached. Venice offers a level of visual pureness; maybe it is the absence of cars or the classical open-air museum environment. #48 is no reference to Venice, but then again there is no textbook reference or answer in minimalism; the ideology of earth and purity however is present. The 14th century gothic architecture isn't dripping with stripes swathed in acrylic tones, but the canals do pulsate warm glows from reflections saturated in auburn, ochre, and red––reminiscent to six stripes of brown, yellow, green, and red. ¹ Irving Sandler, “New York Letter,” Art International 5 (October 1961), p. 56.